All sales are final. There will be no refunds or exchanges. Please carefully review your order before completing your transaction. Every Friday and Saturday night when the clock strikes twelve, it is time to gather beneath the sidewalks of normalcy and enter the dark, glittering underbelly of the Market. 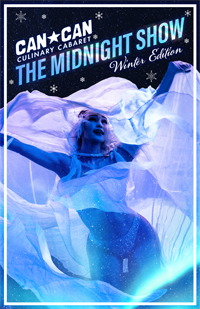 It's time to peek under the infamous petticoats at Can Can and get a taste of Seattle's hottest burlesque stars at The Midnight Show. Please read through all ticketing information before booking. All tickets are non-refundable, no exceptions, so it is important that you have read and understand all ticketing information. Please contact info@thecancan.com with any questions. If you're having trouble booking, please contact Ticket Refuge at 1-877-280-7831. Whether you're a party if 2 or 60, all members of a party must use the same "party name" when booking their tickets. You'll find the area to enter this immediately following the payment screen. This lets the host know you are all one party, and we will do our best to seat you together. Failure to book with the same party name may result in your party's inability to sit together as one group. Can Can Kitchen and Cabaret opens at 5:00PM. Show seating begins 30 minutes prior to start time. Can Can Kitchen and Cabaret does not offer seperate checks. We require that each party pay with one credit card. We will ask you to present the card your party will be using to pay your bill upon seating. This card will be returned to you along with your bill at the end of the show. We apologize for any inconvenience. Due to the nature of our ticketing, General Admission parties of 6+, and all VIP and Preferred tickets will have a 20% gratuity added to the check. By purchasing your ticket you are agreeing to this charge.